The much speculated Vivo Xplay 3S is now official. The news comes from China as Vivo moves to announce the date it will be up for grabs. The hardware and software used are top-notch enabling it to supersede the current Android heavy-weights. With a screen size of 6″ and a resolution of 2560 x 1440, the phone is a monster. Even with the large screen size the PPI comes out to be a stunning 490. The display isn’t the only eye-catcher here, the Xplay 3S houses a fingerprint scanner just below it’s camera, much like the button placement on the LG G2. The Xplay 3S also houses a dedicated audio chip, enabling features such as DTS Headphone:X. Nothing unusual with the chipset as the Snapdragon 800 is ticking under the hood, support for “TD-LTE” and” FDD-LTE” is also present. A newer chipset would had been better considering the high resolution of the screen. The Vivo Xplay 3S sports a f/1.8 lens on the 13 MP sensor. This should result in good image quality since the aperture is bigger and the sensor is also stands at a healthy 13 MegaPixel. 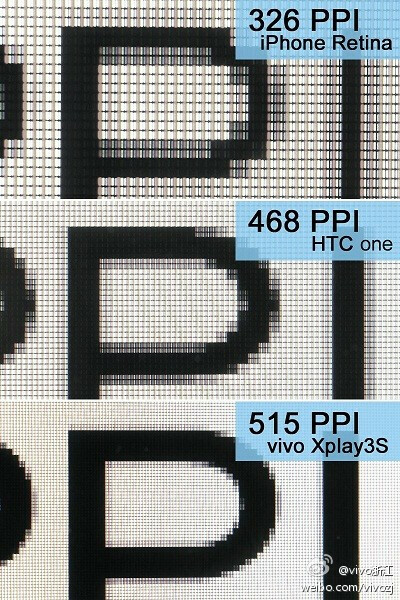 490 PPI is quite above Apple’s “Retina” standard, this may push other leading manufacturers to start producing phones with equivalent resolution screens. The OS side is covered by Vivo’s own Android ROM. The price for this beauty is $580, not very steep considering the hardware you are getting. In other news, Samsung is testing a Galaxy S5 contender, the “SM-G900x”, the latter also has a 2k resolution screen. LG IRIS Scanning Technology to be Introduced with Next LG Flagship!